In the volatile world of penny stock trading, using the best penny stock trading software to place orders and manage your trades is crucial. For 2018, these are the two best brokers with free trading platforms that are very well-suited for penny stock trading. 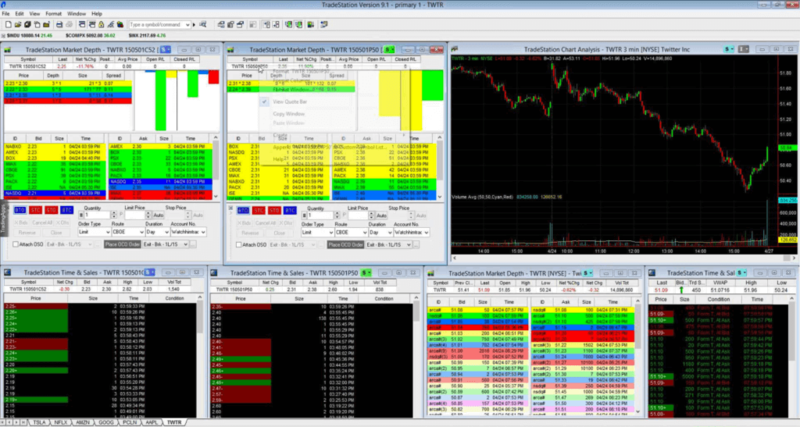 Both of these platforms (TradeStation Pro and Zacks Trade) are downloadable, customizable, and user-friendly. Zacks Trade doesn’t have any platform or inactivity fees, and offers full level 2 depth of market quotes on penny stocks around the globe. Plus, they have a great selection of hard-to-borrow penny stocks for traders who like to bet against the market. Second only to Zacks Trade, TradeStation offers a phenomenal penny stock trading platform. TradeStation’s platform can handle everything from complex order types, to finding new penny stocks based on intraday volume and market caps. It’s tough to go wrong with TradeStation or Zacks Trade, but professional or full-time traders might appreciate the powerful trading platform and free broker-assisted trades that Zacks Trade offers, and recreational traders might find TradeStation easier to navigate for the first time. Because a large part of penny stock trading involves shorting penny stocks, i.e. betting against the current price, you need to make sure that your trading platform is on point, but you also need to make sure your broker has good borrows available. This is why I recommend having accounts with both Zacks Trade and TradeStation, because sometimes one broker will have shares available to short for a specific penny stock, and sometimes the other broker won’t. Since there are no inactivity or account maintenance fees with either of these brokers, having two accounts and having access to two phenomenal penny stock trading software platforms can’t hurt your trading. You bet. Penny stocks are some of the most volatile stocks in the entire market. This is a double-edged sword, however. Anytime there is volatility there is opportunity. With market capitalizations (the entire worth of the company) typically less than a few $50 million, small buy and sell orders can have dramatic effects on market prices. If bullish news for a penny stock comes out, like an FDA approval, earnings beat, etc., there’s no telling how much the stock could soar. Back in 2015, one trader was short KBIO, held his position overnight, and the following morning the stock opened up over 300%. Because the trader was short, he had to buy back his shares, but just about everyone was scrambling to get their hands on some shares. Long story short, his trading account went negative by over $100,000. Make no mistake, penny stocks are not like regular blue-chip buy-and-hold investments. Penny stocks move quick and fast, so you need to use a trading platform that can keep up – seriously. Imagine being short a stock like KBIO, trying to close out your position, but your penny stock trading software freezes and stops responding. It’s all fun and games until your trading software lags and is the reason for a losing trade. TradeStation and Zacks Trade offer professional, reliable platforms, and they do it an no extra cost. It behooves responsible traders to use the best software possible.